A view of the European Central Bank in Frankfurt. The bank kept interest rates unchanged. 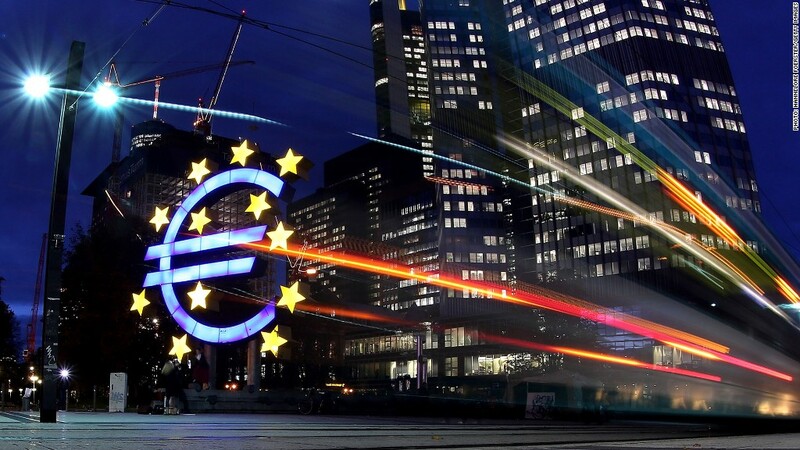 Europe's leading central banks kept interest rates unchanged Thursday, but economists said the worsening near-term outlook for the region's economy could lead both to relax monetary policy still further early next year. The European Central Bank held its main interest rate at 0.75%, citing balanced risks to inflation, while the Bank of England kept rates at 0.5% and said it would not be adding to its £375 billion program of quantitative easing. The European Commission slashed its forecast Wednesday for eurozone growth in 2013 to 0.1% from 1%. Speaking after the ECB meeting Thursday, bank president Mario Draghi said overall economic activity in the eurozone would remain weak in the near term, signaling a downgrade to the bank's own forecasts due next month. "Most recent survey evidence extending into Q4 does not signal an improvement," he said at a news conference in Frankfurt, adding the risks to growth were on the downside. "This is bound to influence our projections in December." Growth in Germany -- Europe's biggest economy -- will fall to 0.8% in 2012 from 3% last year and maintain that subdued rate of expansion next year, according to the commission's forecasts. "Germany has so far been largely insulated from some of the difficulties elsewhere in the euro area. But the latest data suggest that these developments are now starting to affect the German economy," Draghi said in a speech Wednesday. Further evidence of a German slowdown came with figures showing exports fell 2.5% in September, compared with August. The ECB has steadied investors' nerves about the eurozone crisis with its plan to buy the bonds of heavily indebted governments such as Italy and Spain, provided they apply for a formal bailout program. The bank's Outright Monetary Transactions (OMT) program, as the bond purchase scheme is known, has driven down yields on Italian and Spanish bonds, without it yet being activated, encouraging Madrid to hold off making a request for assistance. Spain sold bonds Thursday to complete its financing for 2012, further easing the pressure for a bailout. The ECB is reluctant to take any further measures until OMT has been given a chance to work, but Draghi said the bank stood ready to act with "the standard, normal monetary policy instruments" if necessary. Some economists believe both the ECB and the Bank of England will have little choice but to provide further monetary stimulus for the European economy early next year. "With the Eurozone facing a difficult fourth quarter after almost certainly suffering further GDP contraction in the third quarter, and with the underlying inflation situation in the eurozone looking far from alarming, we believe that the ECB will take interest rates down from 0.75% to 0.50% sooner rather than later," said Howard Archer, chief UK and European economist at IHS Global Insight. The British economy emerged from recession with stronger than expected growth in the third quarter, helped by one-off factors such as the London Olympic Games, but recent data have painted a less optimistic picture and the external environment is deteriorating. "We still expect real GDP to disappoint and for this to drive the [Bank of England] to deliver £50 billion of quantitative easing in February," said Philip Rush, UK economist at Nomura. James Knightley, economist at ING, pointed to weak European data and worries about the ability of the U.S. government to avoid driving the world's biggest economy over a fiscal cliff of tax rises and spending cuts at year end. "The longer it takes to reach an agreement on preventing a recession-inducing wave of austerity, the more damaging it will be for confidence, risk appetite and growth both in the U.S. and globally," he said. "This is why we don't believe the Bank of England is finished with its stimulus efforts," he said.